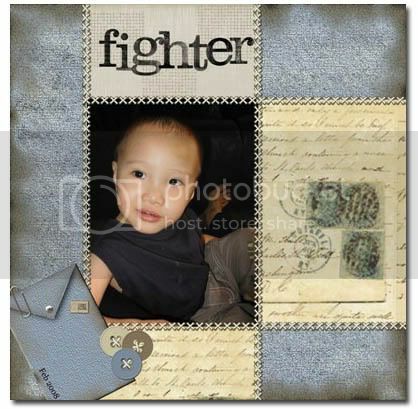 Ethan Boy · He’s a fighter, baby! Last Monday, the first day of work after the long Chinese NewÂ Year break,Â when Ethan woke up in the morning, my maternal instincts told me something was wrong.Â His body felt slightly warmer than usual and when I took his temperature, it registered a slight fever.Â However, it went down about half an hour later after I gave him the PCM suppository.Â But when we arrived at Mrs Tan’s in the evening to pick him up, we were told that he was still nursing a fever.Â That day, Pete and I had not had our dinner prior to picking him up, so we decided to go to Old Town for Ethan’s favorite chicken koay-teow.Â Unfortunately they had ran out of koay teow that day, so poor Ethan boy had to watch us eat.Â He didn’t want anything else except the koay teow, the poor dear.Â After dinner, we decided to just swing by a chicken koay teow stall and buy him a packet, but he wouldn’t eat it at all when we got home too. His temperature had gone up to 38.2Â°C then, so I sponged him down with some warm Eucalyptus water, gave him another dose of PCMÂ and changed him into his pajamas.Â After a few moments of watching Baby Einstein, Ethan, who was way much quieter than usual, fell asleep in my arms. The next afternoon, we decided to take him to see Dr Jessica, just to be on the safe side.Â No doubt his fever had diminished, his appetite was back to normal, and he was grinning away that day, we still felt better if we got some reassurance from the doc.Â Ethan was very cooperative throughout the entire checkup, staying very still when the doc took his temperature and checked his ears.Â He only complained a littleÂ when the doc wanted to check the back of his throat.Â In fact, he even obediently sat still on the weighing scale while he was being weighed.Â When his name was called in to see the doc, he didn’t want to go in, but when we were ready to leave, he didn’t want to go.Â In the end, we carried him out with him giving Dr Jessica a loud flying kiss. Dr Jessica said he was all right, and the temperature could very well be a viral infection, which our boy had fought off on his own.Â When we heard that, we were so proud of our little fighter there… It really means a lot to me that he can fend off illnesses on his own now that he is no longer breastfed.Â The two years of breastfeeding prove very worth the while. I hope he is all better now. Every time they fight and win, they are stronger. Joyce says: I keep praying he gets stronger and stronger each day. Another fever? Sure it’s not because Ethan’s all hyped up about Valentine’s Day now, is he? Hehehe. Get well soon, lil’ fighter! Joyce says: Haha…I doubt it! Glad to hear that he’s all ok now. Sometimes, they get mild fever when they’ve over exhausted too. Just need to get enuff rest n fluid. Joyce says: The trick is how to give him the rest when all he wants to do is run around! Joyce says: I’m like you too. And I am sure all mothers feel the same way.